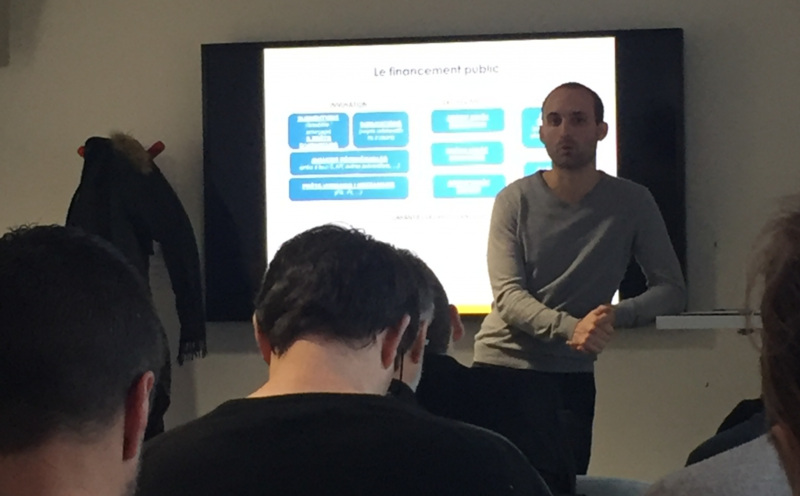 Partech Shaker hosted Vincent Macé, expert in funding working for iii Financements, for an Entrepreneurs'Talk session dedicated to funding of innovative companies. France stands out in its support for innovation, but there are also a number of caveats to be addressed on the subject. For entrepreneurs, this environment appears to be particularly disparate with substantial territorial differences, in addition to being complex and time-consuming. Public support can put entrepreneurs at risk of having to spend more time looking for funding than focusing on their startups. There are currently about 1000 funding schemes, 900 of which are too limited in amount to have a real impact. Moreover, receiving funding is a very slow process. Entrepreneurs in need of immediate resources may not receive the money for several months. So why turn to this kind of funding? To start, banks offer little or no funding for innovative activities. While this is certainly opening up somewhat depending on the territory and on the account manager, entrepreneurs just beginning their activity should not count on receiving funding from banks. However, in the medium term, banks do become the leading funding institutions. Entrepreneurs should meet with their banker from the start of their activity to begin developing a good relationship. And other sources of funding are also possible. Friends and family can give entrepreneurs a boost, business angels step in when they see potential in an idea, and venture capital funds are likely to commit larger amounts – while having very precise in their measurement of risk. In France, there are four major public systems for supporting innovation: guarantees for bank loans, innovation funding schemes, tax credits and international support. To apply for innovation funding schemes, entrepreneurs must submit an application and explain the technical developments that they intend to put in place (and that they likely won't, as the unexpected is standard in innovation). The fundamental principle is that the company is never funded by more than its total capital. In general, the funding amount depends on the research and development budget committed. Public players cover at most 50% of these costs. Consequently, if startup founders want to take advantage of this public aid, they need to be realistic in regard to their financing capacities. The first funding scheme is the honor loan (prêt d'honneur), which is similar to quasi-equity. These loans can be taken out from Réseau Entreprendre, Paris Initiative Entreprise, Raise or Total Développement. They are loans to natural persons, to be reinvested in the company. The natural person is the personal guarantor of the loan, but the loan is guaranteed to 70% by the public, thus limiting the risk of personal loss. This type of funding can help support a company's launch during its first two years. The second type of funding involves small grants. These are for companies in the seed stage with little capital. This type of funding includes the Investments for the Future Program (Programme d'investissements d'Avenir – PIA) for startups in an incubator, the French Agency for International Investments (Agence française pour les investissements internationaux – AFII) and the BPI. More technological products have a greater chance of receiving this type of grant. The third type of funding involves large grants. This type of funding typically comes on the European level, such as Horizon 2020, and is often focused on projects which are very technological in nature or represent collaboration between companies and research laboratories. Very few projects receive these grants. There are also recoverable advances, like zero-interest loans, which provide a cash advance without personal liability. Lastly, the fifth scheme is the hybrid loan or mezzanine financing. These are offered once a company has already received BPI-type funding. A seed-stage investment loan amounts to 50% of raised capital. At 5% but with deferment of three years, these are expensive but available to startups that will not be funded by a bank. Tax credits make it possible to deduct innovation spending from corporate taxes. If the startup is profitable, this spending is not taken into account in the tax. Otherwise, the French State reimburses the difference. The procedure is automatically approved, but is controlled by the tax authorities. In the case of the research tax credit (crédit d’impôt recherche – CIR), the objective is to fund innovations that surpass the technical state of the art in terms of R&D (patents). Effectively, the reduction is equivalent to a percentage of the salaries of the individuals in charge of R&D (engineers, doctoral graduates and doctoral students). This scheme takes into account research with public laboratories or companies with CIR accreditation. There is no limit on the amount of the credit. The research tax credit costs France €6 billion annually. The innovation tax credit (crédit impôt innovation – CII) is a bit more flexible. Applying to prototyping and major innovation, it is limited to 20% of a total expenditure of €400,000. Lastly, the export tax credit (crédit impôt export – CIE) follows the hiring of an employee abroad. Half of the employee's pay can be declared. This is cumulative with market survey insurance (assurance prospection) (Coface). The purpose of this type of aid is to support market surveying. It includes the market survey insurance offered by Coface. The insurer reimburses 65% of the difference between surveying costs incurred and company turnover. For example, if surveying spending is €100,000 and the company's revenue is €10,000, COFACE reimburses 65%*(100,000 – 10,000). When the company generates a profit, it then reimburses these advances. Lastly, international support includes guarantees for international projects, i.e. projects outside of the European Union.